Home / Can Food Be Medicine Against Cancer? The book’s reader-friendly, inspiring style and easy-to-navigate structure provide quickly accessible, highly informative, helpful, practical information and insights. Does eating certain foods make any difference against cancer? How do I know which food to eat? Can I really trust what I read? The book retails for $24.95 with net proceeds going to further research. You can purchase the book in hard copy (paperback ISBN 9781925152234) via this website. 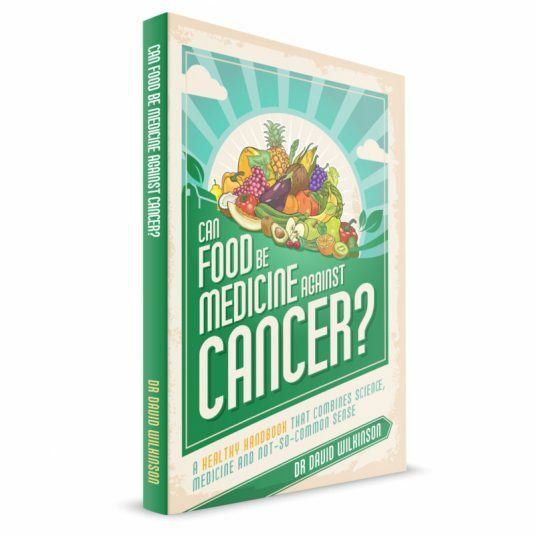 As well, you can go to a website dedicated to the book and its findings at www.foodagainstcancer.com, where you wil also find articles directly related to the content of the book written by Dr Wilkinson. The book is also available via all good bookstores (distributed in Australia by www.dennisjones.com.au), select health clinics or consider asking your local library or educational institution to purchase it. Written by surgical oncologist Dr David Wilkinson, ‘Can Food Be Medicine Against Cancer?’ is a healthy handbook that combines science, medicine and not-so-common sense.